Akshay Kumar: Biography, Filmography, age, lifestyle, income, house etc. Rajiv Hariom Bhatia whom we all know as Akshay Kumar and he is superstar of Bollywood industry. Akshay Kumar is an Indian Film Actor, Producer, Host, Stuntman and also a Social worker. In his 25+ years career he appeared in over a hundred of films and he has won The Nation Film Award and 2 Filmfare Awards. Akshay was also honored by Padma shri by Government Of India in 2009. Akshay Kumar born on 9 September 1967 in Amritsar in a Punjabi Hindu family. His father Hariom Bhatia was a army officer and mother Aruna Bhatia was a housewife. He lived and grew up in Chandni Chowk, Delhi then his moved to Koliwada Mumbai. 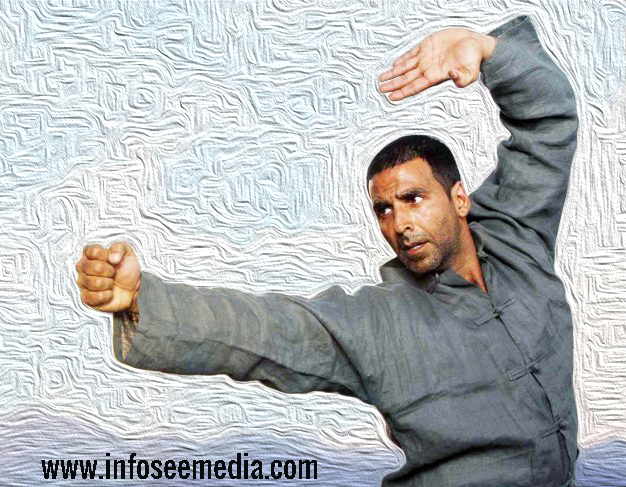 Akshay Kumar completed his schooling from Don Bosco School, Here he also learns Karate with studies. Then for higher education he joined Mumbai’s Guru Nanak Khalsa College. His interest was not in studies, that is why he left his studies after 12th and started doing little jobs for his expenses. Since childhood Akshay likes sports too much, For this reason, he went to Bangkok to get training martial arts, and there he also worked as a chef for his expenses. After that he came to Kolkata and worked in a Travel agency, then he moved to Mumbai, where he sells Jewelry of Kundan. So far, he was working without any goal. Akshay had thought that he would earn money by his hard work weather the work is little or big. With work he also teaches Martial Arts to some boys in evening. One of his Martial Arts student tell him to do modeling because he looks very good. One day that student came tooks some photographs of Akshay and send them for model assignment. And Akshay got selected for modeling. Then Shoot is started and completed in two days for which Akshay got 20,000 Rs. After this Akshay thoughts ” I can hardly earn 5,000 rs in a month by doing many works, but here they gave me 20,000 rs in 2 days for sitting in chair and giving some poses! ,so I have to give my all focus in this field”. After that, he continue doing small modeling. One day Akshay had to go to Bangalore for modeling work, but he was missed the aeroplane. The flight from which he had to go to Bangalore was at 7 am, which he thinks at 7 pm. The flight from which he had to go to Bangalore was at 7 am, which he thinks at 7 pm. He become very sad that he missed a good work. At the same time he came to know that well known director Pramod Chakravorty has came to Natraj Studio, then without wasting any time Rajiv went to Natraj Studio. There he send his portfolio to Pramod Chakravorty through the makeup artist. Promod was very much impressed with the photographs and signed his for a small role in movie. Then in 1990 he takes acting course to improve his acting. After this he get a small role in movie Aaj. After release of that movie he found that, his role in that movie is just for 7 seconds. But Rajib liked the name of the movie’s lead carector, which was akshay. So he changed his name from Rajib Bhatia to Akshay Kumar. In 1991, in the movie Saugandh he first acted as lead role. And in 1992 he acts in a successful movie Khiladi. Ever since then he had appeared in more than 100 movies in his 27 years career and became the Superstar Khiladi of Bollywood.